Redeemable at BestBuy.com where available for merchandise or services including Magnolia Home Theater and Geek Squad. Visit BestBuy.com to find your nearest store location. To check your balance, visit www.bestbuy.com/giftcardbalance or call 1-888-716-7994. For full Best Buy gift card Terms & Condition, visit BestBuy.com/gcterms. 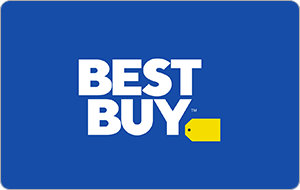 BEST BUY, the BEST BUY logo, the tag design, MY BEST BUY, and BESTBUY.COM are trademarks of Best Buy and its affiliated companies.